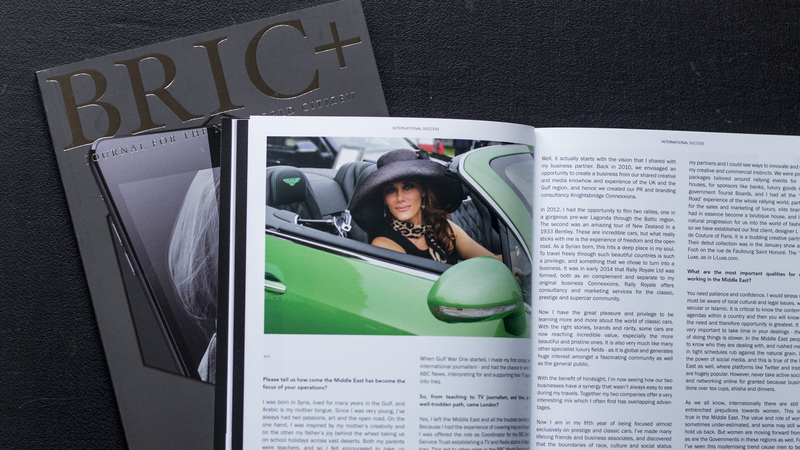 BRIC+ is a contemporary magazine based in London that interviews successful entrepreneurs and ideas makers all over the world. The magazine editor, John Hellings, interviewed Ruba to hear more about her eventful life journey and places it in a magazine bursting with extravagance, success, and adventure. Passion, charm, vivacity and elegance can overcome the toughest challenges and greatest resistance, even in a traditional male-dominated part of the world like the Middle East … Some have a vocational calling which propels them irresistibly down the path of success, whilst others use their intuition, their passions and their strengths to steer a way … Syrian-born Ruba Jurdi fell in love with driving and the open road as a child. The interview with Ruba Jurdi can be found on page 48/9 of BRIC+ issue 6.